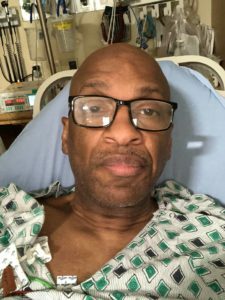 World renowned gospel musician, Donnie McClurkin has survived a recent ghastly car accident he got involved in on Wednesday. The 59-year old American singer shared the miracle and God-saving experience on his Facebook page on Thursday. McClurkin who landed in the hospital following the accident stated that he suddenly lost consciousness while he was driving but was rescued by “two human angels”. As at press time, the singer was undergoing various tests but is thankful to God to be alive. “Was in a serious accident at 12:50am this morning…passed out while driving on the highway. Totaled the car…hospitalized, going through a myriad of tests…..
“Lost consciousness driving…but two human angels followed my swerving car with their emergency blinkers on to stop traffic ….drove behind me until my car crashed into the middle concrete island. I remember none of it except those two angels pulling me out of the passenger’s side of the crumbled TOTALED car..airbags deployed…crushed metal and Fiberglas!! “I am still here by the grace of God!